What should you do when you see a fight on the street, only three meters away from you? It happened to me today in Downtown Eastside of Vancouver. I hade a nice morning wake up at Peggy and Jeff�s place. The kids appeared in the living room at 7.30am and started watching cartoons on a Seattle based TV station. Fletch made me a bowl of cereal and things went very easy. Today Jeff is going to show me downtown Vancouver, but first I had to do some writing and get some work done for this website. While I could take all the time on their computer with a high speed cable connection, Jeff made pizza for an early lunch. So we bummed ourselves through the city centre which is undergoing big construction works on every street. High apartment buildings arise at every corner, while 18th century warehouses are being taken down. (Map of Vancouver) We walked down Granville Mall, where I easily counted six cinema theatres. It all was colourful around here. Banners wave in the wind. 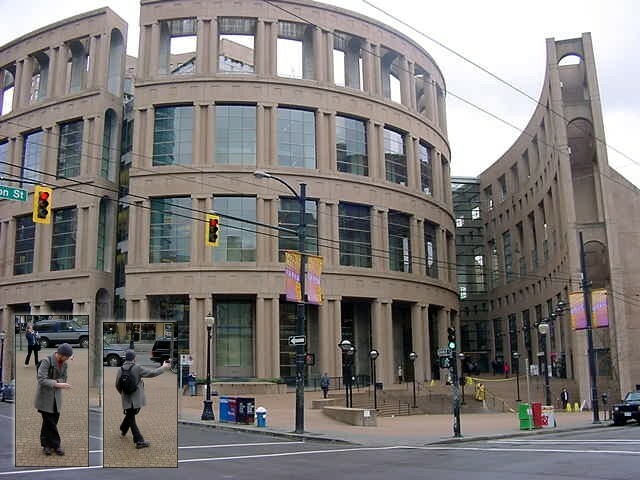 From Granville Mall we walked down Nelson Street where Jeff showed me the Vancouver Public Library. I think this is one of the coolest buildings in town, as it actually is a modern remake of a historical coliseum. From Nelson Street we got back north again on Homer Street and at the top of this semi-peninsula of Vancouver City, we walked on Hasting Street east through Gastown and Chinatown. Eventually we went to visit a friend of Jeff who lives in the area named Mount Pleasant and to get here we walked quite a while down south Main Street. We got there just before it started to rain. We visited Jeff�s friend Glenn on 12th Avenue West, and he is an arty designer, musician and screenplay writer, who has been living on the attic of an inspiring old house for the last four year. �I think this is one of the cheapest places to live in Vancouver, at the moment. That�s why I never moved out of here,� he explained. At his small place we listened to music, discussed the internet and travelling, while al snacking from a cheese plate (cheese blocks on pizza bottoms). 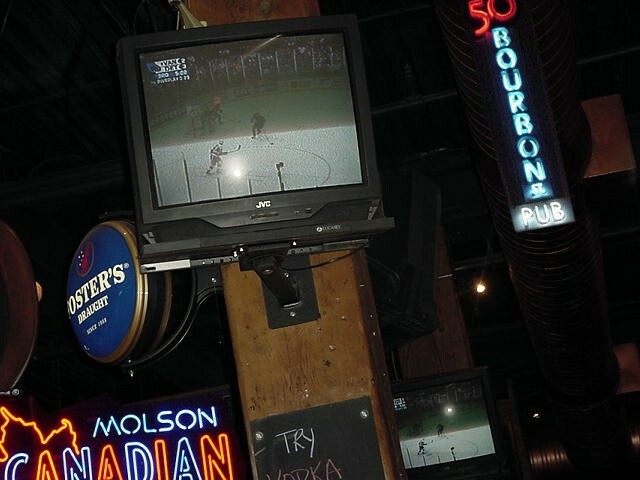 On the television the ice hockey games started with the Detroit Red Wings against the Vancouver Canucks. �Ramon, at the end of your Canada tour you will love ice hockey!�, Glenn said, very excited about this game. Fortunately the guys could see I was still fighting a bit of a jetlag, so while they watched the first half (of three) of the game, I had a quick afternoon nap on Glenn�s bed, before we would head out to town again. Jeff had to go to his evening course again (�I hate selling things!�), but we would meet up again later this night. Glenn would take me for another tour through town and we would all end up in a pub somewhere. Sounded good to me! From the depressing Downtown East Side we planned to walk to Gastown, where Glen wanted to point out the contrast of the city. But before we got there something happened that shocked both of us! We just got to a traffic light when I noticed one dirty long haired guy harassed some man coming out of a caf� with some food in bags. The man first ignored the guy, but then got kicked in the back. He turned around and got a fist in his face. Now this is the point where the man decided he had to fight back and dropped everything. Both of them started fist fighting on the street and soon the even rolled off the street on the pavement. I was not even standing three meters away from this and it all went so fast. Two folks were really very angry at each other. Back at home there is so much fuss going on about people who don�t help other people anymore while they are being in a dangerous situation. That was it that was going through my mind several times these fast seconds. And there I was standing, and it was clear to me: I was in exactly the same situation. Some six other people watched the fight, some just walked by and ignored it. Nobody did anything. The man was now lying on his back on the pavement and the long haired guy was on top of him. Suddenly the guy had hold of the man�s head and was smashing it on the pavement several times. In my head I could already see the blood coming out of his head, a few minutes later and I just didn�t want that to happen. That�s when I jumped in and pushed the guy off the man. It was a very short hassle, I needed some grip and a firm push, and the man on the pavement got up and was ready to start the fight again with the other man. The long haired guy was very surprised that I pushed him off and mumbled things I could not understand. He looked drug stoned, moved towards me for a sec, but then walked away like nothing had happened. Meanwhile I was holding the handle of the other man�s backpack to prevent him from going after that junky. I wanted to say something to him, but was speechless myself� What could I have said? I felt sorry for him! Life continued again, people started walking again and the man picked up his broken glasses off the street and looked at the food he had to buy again. Glenn and I crossed the street. Glenn was right about that carefulness, but still I couldn�t understand that nobody else was stopping somebody who simply got hurt for ignoring a junky. �It was just wrong!� I said. 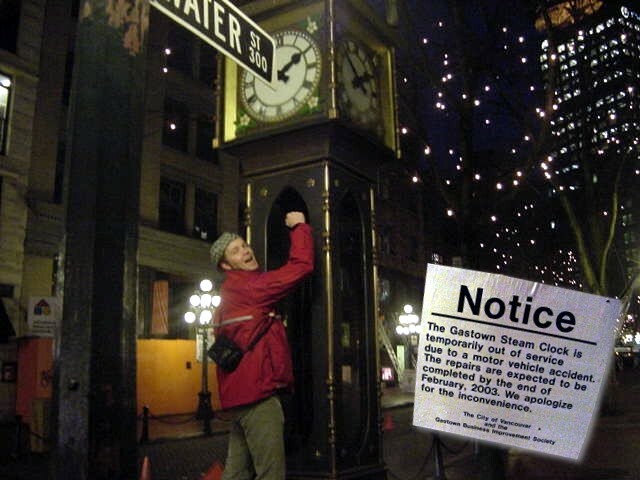 We walked in to the area named Gastown, which is the total opposite of the East Side and where they say the city of Vancouver started out. The fight was just two blocks down the road, but here there were Christmas lights in the trees, the streets were cobble-stoned and it is full with expensive restaurants and hotels in fascinating Victorian architecture. Two blocks down two people were in a fight and nobody cared! Not even me, because I only jumped in when I thought the man might die if the guy would continue. We were being followed by a guy wearing a white hood who �just had to tell� me that he really appreciated what I did out there. �People don�t do that anymore, these days,� he said. It was in Gastown where we saw the tourist, where we saw the happiness of Japanese people photographing each other in front of any possible structure. On February 22 the citizens of Vancouver can vote yes or no to a possible bid to be a host of the Olympic Games in 2010. The city council decided to ask its citizens first. Should they bid money to �maybe- get a chance to be a hosting city for a two-week sports event? Or not? On almost every street pole I read posters from activists who give reasons to vote No. I would totally agree with that. You have a great city here, but getting that exaggerating sport event here, will cost so much money. Buildings have to be built, complete housing projects to house the sporters (which will become subsidised apartments for the poor afterwards, according to the council) and lots of pumping money in media and public relation. But don�t do that if you ignore the problems that you already have. Don�t move your problems; don�t push them forward as a discussion point for a next meeting. Deal with it. And, most people who know Downtown East Side know it needs help in anyway possible. Spend money on society, that�s what I always think� (That�s what made me vote the socialists in the Netherlands during the last elections last January). 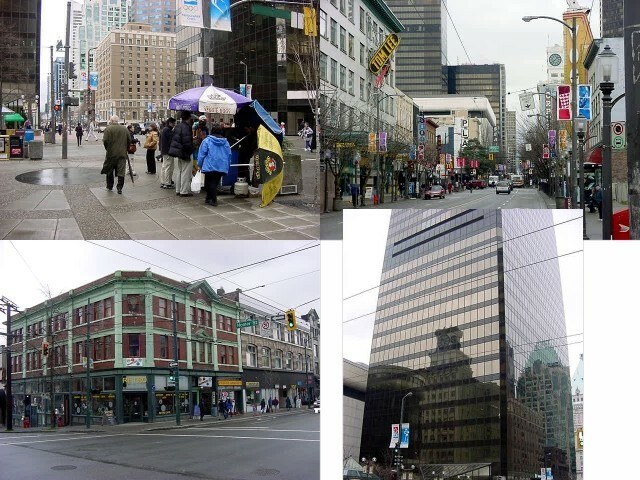 We walked on back through the uplifting Vancouver City Centre again and went in Glenn�s favourite pub: the 50 Bourbon Street Pub. 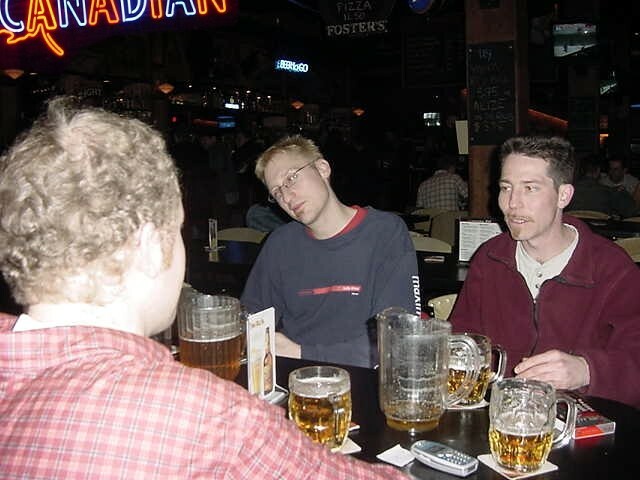 Here we discussed the things we experienced and thought about that evening, while the third and last part of that hockey games was shown on different televisions. Every goal made the whole place cheer. 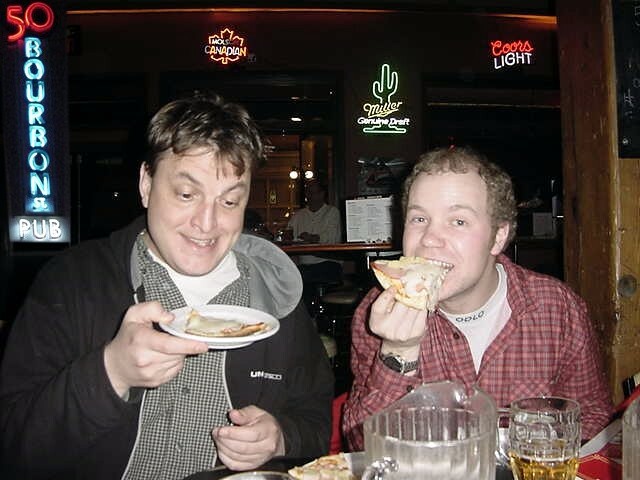 We drank Rickard�s Red Beer and �cheap Canadian beer� and watched the game end with a 4-3 victory for the Vancouver team while munching on a pizza. The victory made everybody happy in here. Just after the game, a few friends of Glen joined our table and our conversations flew into Glenn�s desillusionizing meeting with his big idol the writer Douglas Adams (passed away in 2001), who refused to give Glenn a simple thing as an autograph, to Glenn�s adventure as a Santa Clause in Ontario and etcetera. Debra was a lady who had joined us to and Debra works as a security guard at The Carnegie Community Centre in Downtown East Side. She told me about the drug addicts, the junkies, the dealers, the unfortunate lifestyle of the people there, criminal violations and strange laws. She sees it every day. Due to what happened tonight and what we discussed at the pub tonight, 50 Bourbon Street already has a special place in my head. John, another one at our table, is going to invite me too after hearing about my way of travelling and advised me to contact the Vicki Gabereau Live tv show in Vancouver. I should be a great guest. We also talked about the famous radio man and writer Arthur Black, who once interviewed me for his CBC-radio show Basic Black in 2001 (listen to the audio file). Black has said during the interview that I should come over to his place when I�d get to Canada. And everybody at the table told me I should just contact this man again. He lives on one of the Gulf Islands outside of Vancouver, Salt Spring Island, seen as a hippie commune. Well, okay, I might just send him an email. 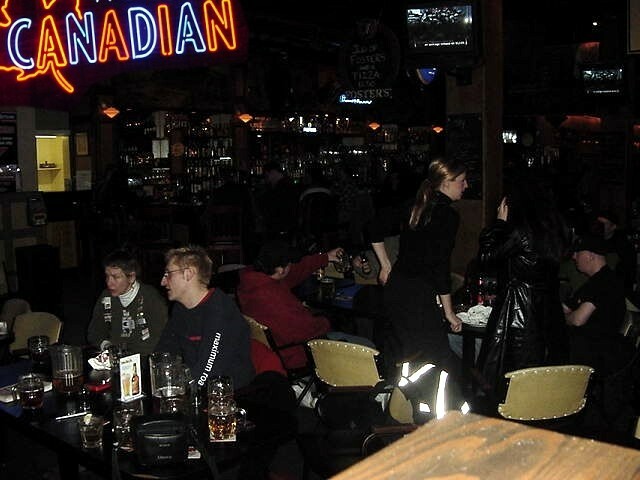 Another fascinating thing in Canada I experienced today was the smoking ban in all pubs and restaurants. Therefore all smokers have to stand outside. So occasionally I joined the smokers at our table, who all are already used to the fact that they have to get dressed again to have a smoke outside every few times an hour. Around 9pm Jeff joined us at the table and showed us his passion: his jojo-tricks! He�s an excellent performer and is even booked to perform at a school next week. It was funny to see him jump around this place with his jojo. It was nearing midnight when Glenn, Jeff and I got back home with a taxi. It has been a long day and the beers started to affect my thinking, but it was all okay. It was a good night after all.